India Inc.'s interest-paying capability shows signs of improvement, but the companies may not be out of the woods yet. The economy is struggling to cope with fast-piling corporate debt but going by the Business Today analysis, India Inc's debt-servicing capability has improved. Out of the BT 500 companies (ranked on their average market capitalisation between October 2016 and September 2017), we have excluded the banking, financial services and insurance firms and a total of 378 companies, whose comparable data is available, have been considered. As per our findings, the combined interest coverage ratio (ICR) for the sample companies improved to 5.2 times in FY2016/17 from 4.8 in 2015/16. It was 5 times in 2014/15 (see table Debt Cushion Gets Bigger). ICR is a crucial yardstick that measures whether a company's available earnings are adequate to pay interest charges on its outstanding debt. To calculate, a firm's earnings before interest and tax or EBIT is divided by the interest charges for the same period. And the higher the ratio, the better the company's safety margin. When a firm's ICR deteriorates to 1.5 or lower, its ability to pay interests becomes doubtful. In the sample here, around 349 companies have an EBIT greater than their interest payments. 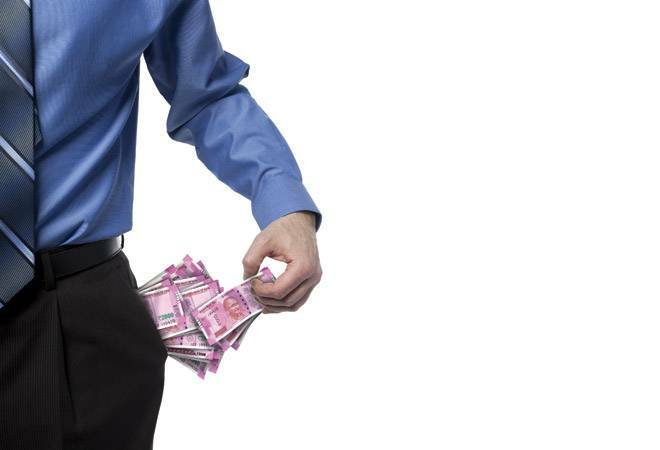 According to Kavita Chacko, Senior Economist at CARE Ratings, "With companies going slow on fresh borrowings and improvements in earnings, there has been an improvement in their debt-servicing ability. But their performance in the coming period, which is contingent on the underlying demand conditions in the economy, will determine whether it is a sustainable turnaround." EBIT for the sample companies registered a double-digit growth of around 14 per cent in 2016/17 compared to 5.6 per cent in the previous financial year. Weak companies, those with ICR of less than 1.5, also showed improvement (see table Share of Weak Cos Falls). 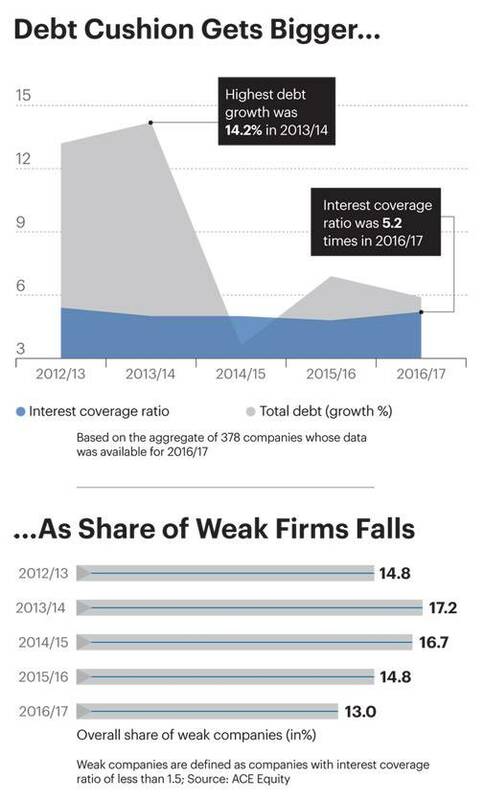 The percentage of weak companies in the sample came down to a five-year low - from 14.8 per cent in 2012/13 to 13 per cent in 2016/17. "The decline of weak companies in terms of ICR could be attributed to various factors such as a fall in interest rates in 2016/17 and companies not undertaking fresh investments, resulting in lower borrowings, deleveraging and improvement in earnings," says Chacko. In contrast, some sectors, including telecom and transportation & logistics witnessed a dip in ICR between 2015/16 and 2016/17. "The deterioration happened because these sectors are weighed down by excessive debt," says Mustafa Nadeem, Chief Executive Officer of Indore-based financial services firm Epic Research. "There are ways to improve ICR - a company can sell off its assets or improve its profit margins. But the ongoing market competition makes it difficult. Transportation and logistics may see some gradual increase due to Goods and Services Tax, but telecom could be under more pressure as telcos are now tagged as stressed books." Interestingly, the average interest cost - the ratio of interest payments and the average of total debt - of the sample has come down to 7.4 per cent in 2016/17 from 7.6 per cent in 2015/16. "Companies were retiring expensive debt from cash reserves besides switching to cheaper credit from financial institutions or the debt market where interest rates were more responsive to policy rate changes," says Madan Sabnavis, Chief Economist at CARE Ratings. Around 13 out of the 20 sectors have an average interest cost above the sample average of 7.4 per cent. Highest rates were seen in the capital goods sector, followed by consumer durables and cement. But sectors such as power and oil & gas had a relatively lower average interest cost compared to the sample. "For oil & gas, it could be on account of external borrowings at lower interest rates," points out Chacko. Interest component can also be gauged by a company's interest expenses to sales ratio. For an industry as a whole, the ratio is quite low at 3 per cent or less, but capital-intensive sectors like realty, power and telecom would have the highest ratio (10-14 per cent), followed by infrastructure & engineering, cement, and mining & metals. As per Reserve Bank of India's Financial Stability report, some of these sectors, including cement and mining & metals, triggered the rise in the stressed advances ratio (gross non-performing assets plus restructured standard advances to gross advances) between September 2016 and March 2017. Aggregate debt of these companies increased at a slower rate of 5.9 per cent in 2016/17 against 6.9 per cent in 2015/16. Incidentally, telecom, power, and oil & gas accounted for nearly 55 per cent of the total debt in the sample. Telecom, power, and mining & metals also saw a rise in total debt to Rs 10,000 crore-plus in 2016/17. However, nearly half the sectors saw a deleveraging with outstanding debt coming down in the last fiscal. Maximum debt reduction happened in chemical, cement, textile and pharma. So, has corporate India's financial health improved, leading to capital formation across sectors? Companies saw their gross fixed assets (GFA) grow at around 12 per cent - from `22.8 lakh crore in 2015/16 to Rs 25.6 lakh crore in 2016/17. But industry wise, the GFA accumulation was concentrated in the three sectors with the highest outstanding debt (telecom, power, and oil & gas), accounting for nearly 57 per cent of the total. The leading sectors seeing GFA growth were oil & gas, power, healthcare, telecom, and mining & metals. "GFA growth was high in healthcare and the absolute level of debt came down, which could be attributed to the use of internal funds for investments," says Sabnavis. It is too early to say whether improved capability means India Inc is out of the woods. The upshot could only be determined by the demand conditions within the industries and the overall economy.